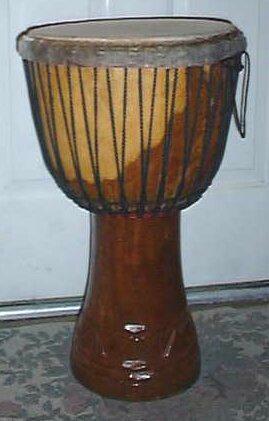 The first drum pictured here is a West African Djembe from Mali. It was hand-carved from a single log and stands 24" with a goatskin head (playing surface) of about 13". Clint Eastwood is fond of saying that the djembe is considered to be the most powerful handdrum in the world, capable of blowing your ears clean off. One of my favorite drum manufacturers is a German company called Meinl. 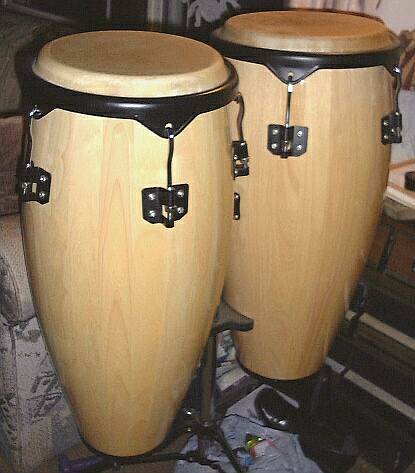 Here are a pair of inexpensive Meinl congas. They sound and play beautifully. Here is Meinl's wooden djembe. You'll see their fiberglass version later. 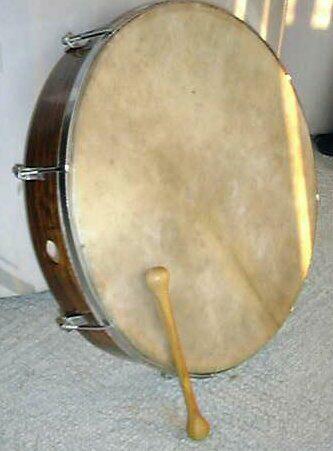 It has a goatskin head like most standard djembes...But it is wrench-tuned like a conga. They call this finish "tobacco sunburst". 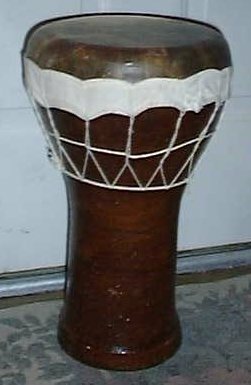 This is a South American drum called a Dakubella (sp?). It is from the same family tree as the African Log Drum. 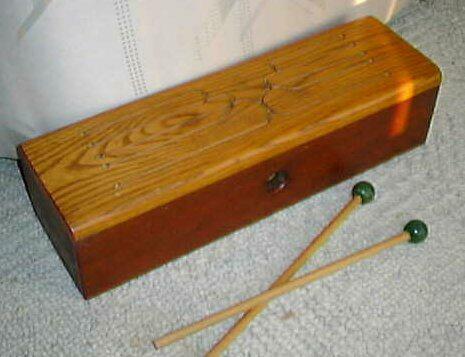 It is also called a slit drum, box drum or tongue drum. Different areas of the playing surface produce different pitches. Its sound is mellow and haunting. 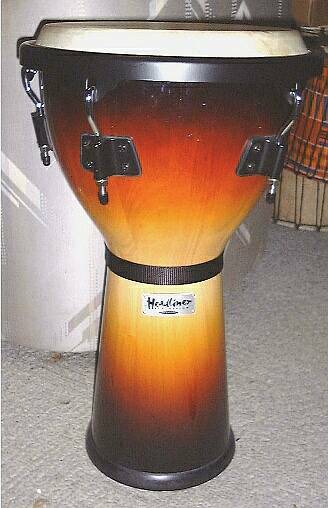 It is the first unusual drum I ever owned. This is a Middle-Eastern Doumbek. It is a heavy ceramic drum with a goatskin head. It got its name from the nice bass sound it makes when struck in the center (Doum!) and the high-pitched sound it makes from its edge (Bek!). This is the ugliest drum I own. It looks like someone slapped on some yucky brown paint with a big, thick brush. It's also one of my favorite lead drums to play as it is very expressive and has a great tone. I found it in a Lebanese grocery store! 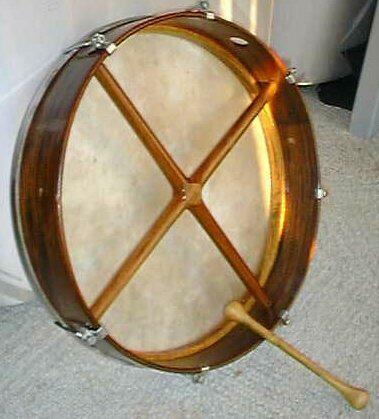 This is an Irish Bodhran. It is played by flipping the double-sided beater against the drumhead. It is capable of a lot more than 'Riverdance' music. It is 18" in circumference, has a tunable goatskin head and sounds incredible when played Native-American style with leather or fur-covered mallets.